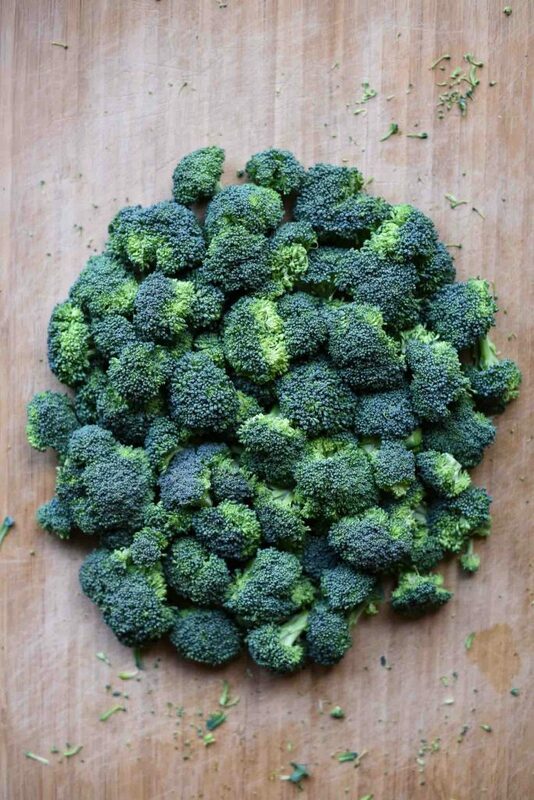 Growing up, I didn’t eat a ton of broccoli. My mom is not a broccoli fan so the only time I got to eat it was when my dad was in charge of cooking for the night. He incentivized broccoli eating by covering it with cheese (which is awesome, by the way) but beyond broccoli as a suspicious side dish, it wasn’t a part of my world. As an adult who appreciates both the taste and health benefits, I try to eat broccoli whenever I can, and vegan broccoli soup is a creative way to do it. Confession: I had never had broccoli soup before making this recipe. I’ve been living on my own for almost 50% of my life, so I suppose this one’s on me. I’ll let the broccoli soup experts out there confirm, but I’m so glad that I took this new direction. 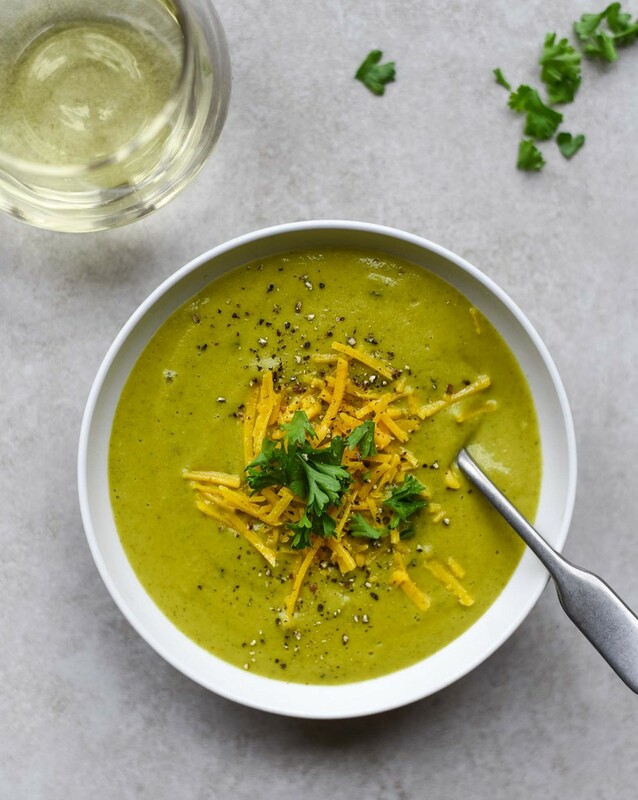 This healthy green soup is bursting with flavor and jam packed with nutritional goodness. 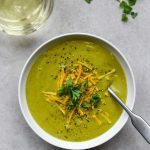 how do you make vegan broccoli soup? It is incredibly easy to make – chop a few vegetables, simmer them in broth, add the cashew cream, and blend it all together. Cashew cream might sound complicated but its just raw cashews blended with vegetable broth. It creates a delicious, creamy base that replaces heavy cream in a non-vegan version. This recipe is perfect for cold fall or winter evenings, or whenever you want a quick burst of vegetable deliciousness. If you’re in the soup-making mood, try this hearty mushroom lentil soup with kale, moroccan chickpea stew, vegan asparagus soup, potato leek soup, or fresh homemade tomato soup. All winners in my book. 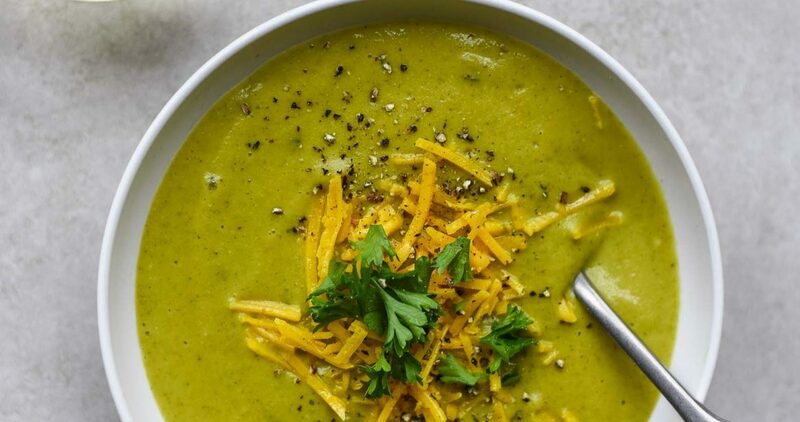 If you make this vegan broccoli soup, leave a comment, rate the recipe, and and tag a photo with #plantandvine on Instagram. I’d love to hear about your soup adventures! Chardonnay: pineapple, yellow apple, chalk, and potentially buttery flavors in this full-bodied white. You could go unoaked for a clean, crisp profile or oaked for a softer creamier, buttery taste. Hard to go wrong either way. Marsanne Blend: pear, apricot, and beeswax flavors in this full-bodied white wine. Lots of different grape varietals including Roussanne, Grenache Blanc, Viognier, and Clairette can be blended for a smooth soup that pairs well without overpowering. Champagne: citrus, peach, almond, and toast flavors with sparkling bubbles. It is fun to pair sparkling wines with soups; the contrast in texture between the two liquids adds complexity to the meal. If you want to learn more about pairing wine with vegan food, check out my wine pairing and vegan wine guides. Got a bottle of wine but don’t know if you should decant it? Check out my wine decanter guide. 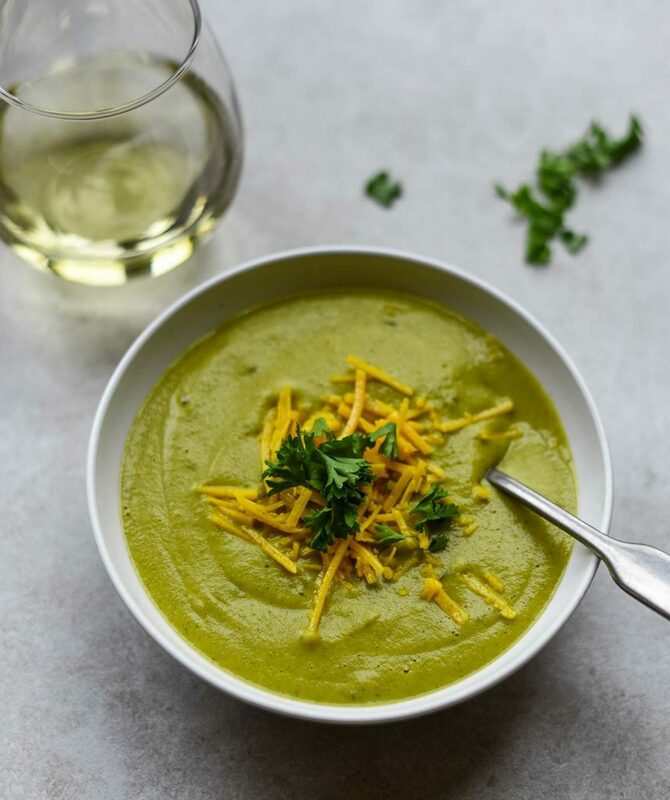 Healthy and simple vegan broccoli soup. Good for getting your veggies in. Add cashews and 1 cup of vegetable broth to blender and blend until smooth, about 1 minute. Set aside. In separate large soup pot, add remaining 5 cups vegetable broth, potatoes, onion, and carrot. Bring to a simmer, cover, and cook for 5 minutes. Stir in broccoli, basil, and cayenne; return to a simmer. Cover and cook until potatoes are tender, about 10 minutes. Add cashew cream mixture, salt, and pepper to soup. Bring to a simmer and immediately remove from heat. Transfer the soup to a blender; blend until smooth. For a chunkier texture, only blend about half of soup. For smoother texture, blend all of soup. Return blended soup to pot and stir well. Add additional salt and pepper as desired. Top with vegan cheese, fresh chopped parsley, and fresh ground pepper. Keeps well in the refrigerator and flavors will continue to emerge with longer time. Store in covered container in refrigerator for up to 3-4 days. *Recipe is a guide. Adapt as desired. I'm the perpetual food, wine, and photography nerd behind Plant & Vine. Wine is not just a meat eater's drink anymore. It's time to diversify dinner. All Content Copyright© 2019 . Plant & Vine LLC . FEAST DESIGN CO.